Priyanka Chopra Jonas is an Indian actress, singer, film producer, philanthropist, and the winner of the Miss World 2000 pageant. One of India's highest-paid and most popular celebrities, Chopra has received numerous awards, including a National Film Award and five Filmfare Awards. In 2016, the Government of India honoured her with the Padma Shri, and Time named her one of the 100 most influential people in the world. In 2017 and 2018, Forbes listed her among the World's 100 Most Powerful Women. Dance India Dance is an Indian dance competition reality television series that airs on Zee TV, created & produced by Essel Vision Productions. It premiered on 30 January 2009. Here the judges are called Masters and Mithun Chakraborty is called Grand Master. The Zee Cine Award Best Male Debut is chosen by the jury. They give awards to the new discoveries of Bollywood where they see some potential. This Category was first awarded in the year 2001. 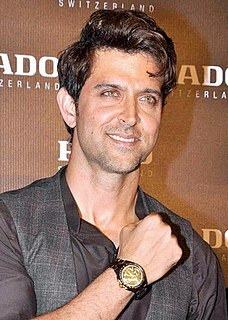 The first recipient was Hritik Roshan for his performance in Kaho Naa... Pyaar Hai. Kites is a 2010 Indian Hindi/Spanish mix language dialogue romantic action thriller film directed by Anurag Basu, story written and produced by Rakesh Roshan, starring Hrithik Roshan, Bárbara Mori, Kangana Ranaut, and Kabir Bedi. The film was released in India and in North America on 21 May 2010. Its 208-theater opening in North America made it the largest Bollywood release up to that time. It was also the first Bollywood movie to reach the weekend top ten, though My Name is Khan had a larger first-weekend North American gross. Reliance Entertainment bought worldwide distribution rights of Kites for ₹150 crore (US$21 million), which is a record sum. Despite a strong opening, The film only managed to collect ₹48.56 crore (US$6.8 million) net in its lifetime run following a critical loss. The film had been aired in a week of its release on smallscreen. ↑ "Winners of Zee Cine Awards 2011". Bollywood Hungama . Retrieved 2015-06-30.